Hundreds youths hurling rocks, burning cars and smashing windows for the second day in a row in Stockholm say they are protesting against police brutality and inequality. In Sweden, critics of the multiculturalism policies lash out at immigration laws. 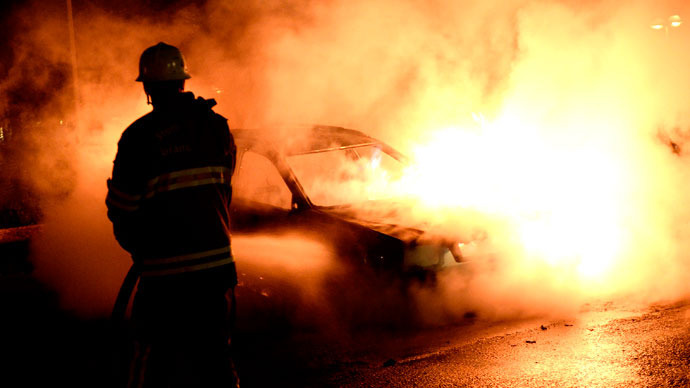 Seven policemen were injured, at least ten cars and countless containers set on fire, and dozens of windows smashed in several heavily immigrant-populated neighborhoods of the Swedish capital on Tuesday. 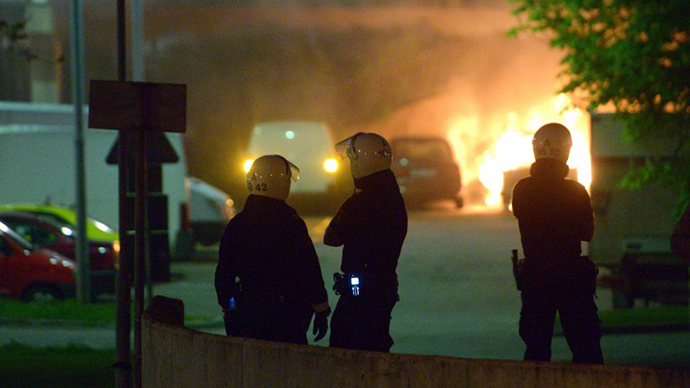 The police said some 300 people are now taking part in riots, which started in protest against the shooting of a man allegedly armed with a knife in the Stockholm district of Husby. The protesters also cited beatings and ‘discriminative’ derogatory remarks of the officers. The protester are mainly young, the police said. Of the seven rioters arrested on Tuesday only four were detained, two of them later released, and one turned out to be underage. All of the men arrested on suspicion of violent rioting and assaulting a public official were aged between 15 and 19, the police said. Swedish Prime Minister Fredrik Reinfeldt on Tuesday commented on the matter, urging a halt to the violence, but acknowledged in the short term that may be unlikely. “We have groups of young men who think that that they can and should change society with violence. Let’s be clear: This is not okay. We cannot be ruled by violence,” Reinfeldt said as cited by the Local. He also urged “everyone, including parents and adults” to help restore calm. “Husby residents must get their neighborhood back,” Reinfeldt stressed, speaking of the district, where around 80 percent of about 11,000 residents are first- or second-generation immigrants. This particular district has seen employment increasing and crime falling in the last seven years, Reinfeldt added, speaking of the “right direction” it has been going. While not elaborating on the incident that caused the current riots, Abramsson said all such incidents have a common “problem beneath” – that is, the immigrants not identifying themselves with the country’s society, nor accepting the country’s authorities, sticking only to their own ethnic group. “They live in their area, and they feel the area is their own. And when the police arrive, they feel they are you intruding into their, sort of, ‘country.’ The police… who work in these areas, there have to be in two cars, one protecting the other. People are trying to maintain buildings, to have security guards, the fire department can’t work, they get attacked by angry immigrant youth that feel like they’re intruding into their own area, even though they’re trying to help,” Abramsson went on to say.